Thanks for sharing the all of the data and details, Brandon. I agree with most of your post, but the only thing that I think is missing is the impact that anchor text has. In my experience, just a couple of exact-match anchor text links from relatively authoritative sites can vastly outweigh other factors including sheer number of links. This is one of the reasons why Google fights so hard to kill paid links; because they work. And the reason they work is because of the ability to target specific, exact-match anchor text. Thanks, this article does illustrate just how important link-building is, very interesting to see the google traffic increase from the #1 spot too! @Hugo – You’re right, anchor text from great domains makes a huge difference. Paid links are great, but you have to pay for them. I’d rather pay my linkbuilders! I can have someone working for a full day for the cost of a paid link. -I reference paid links only to emphasize the value of exact-match anchor text, but the reality is that organic link-building outreach can also result in exact-match anchor text, and that’s typically much more valuable in the long run (because it’s usually permanent and doesn’t cost money to maintain). @Hugo – You’re 100% right about the cost of a link vs the cost of a link builder. I do both on occasion, but my link builders are priceless! You up for a guest post Hugo? Why of course! Email me at hugoguzman11 @ gmail.com so that we can discuss topic, length, etc. This was surprising. I was of the opinion that being number one would be ideal, but your research demonstrates a dramatic difference between number 1 and number 2. This, I did not expect. Pretty interesting Brandon, But obviously quality of links also important at same time otherwise there are several link scheme out there which can build 1000 links within minutes but they always help in getting banned. It is quite weird that the traffic raise only lasted for a day. Are you sure this was not a spike based on social media like stumbleupon ? It seems a lot like this could be the case. If the results are based on getting better google placement, they should be much more stable. Wow! I had no idea that #1 could result in such an improvement over #2. That’s amazing. I’m on page 1 for my search term, but I’m at the bottom of the page rather than the top. Guess I’ve still got a lot of work to do. Your article is very enlightening. I thought there are a lot of factors that could affect ranking number one in search engines. I guess it all boils down to link building then. 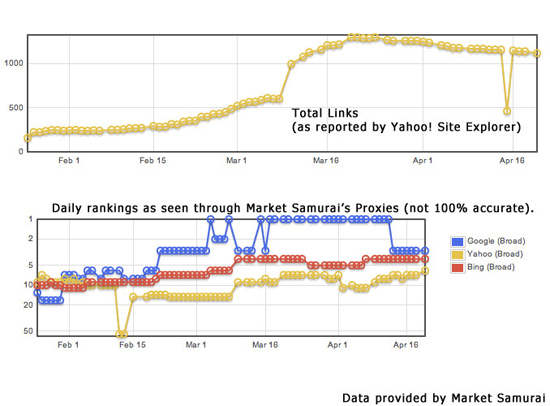 @spyros – go back and re-read the part of the article that I talk about the increase in traffic. My site briefly went to #1, then moved back to #2. The income from #1 wasn’t what I was expecting so I moved on to another project (and the rankings and incoming links started to slip). @Andrew – For most niches I’m in, being on page 1 means nothing. Being #1 means everything. Link building definitely takes a huge part in marketing a business. However, it should be noted that it is not just about dropping links everywhere like a MAD man. It should be about dropping links without being spammy. Love the data Brandon. And you know why 🙂 Obviously with what we do on a daily basis, we see this kind of correlation all the time. I think the latest stat I have seen indicates the #1 position gets 43% of the clicks. @Arnie – It’s hard to get real data (that’s accurate) about search volume. Every company selling data has different numbers. We need Yahoo to accidentally release data again. Links from websites with exact or partial match keywords in the domain can be BIG. It’s a lot harder to do though. Buying links from strong directories never goes out of style. A great illustration of the differences in traffic between position one and two. You wonder if the spike up was from social media buzz or the number of links. Thanks for sharing the data and information! I’m late to this.. but great post. I have seen this first hand.. I rank in the top 3 for some big keywords and my search traffic is very small. From what I have learned, 1st gets like 70% of the traffic 2nd and 3rd pretty much share the rest. It is all about links coming in. page seo, page speed, keyword density all matter a small amount compared to being an authority site with huge amount of backlinks. CTR is the biggest factor in my book for Google ranking. Not page speed, not links, not pagerank, click through rate. This is further backed by the changes to Webmaster tools. I can confirm that moving between positions one, two and three can have a significant, measurable difference in traffic and sales. I work with an ecommerce merchant where the affect of movement between first and second are clearly visible in analytics. You can bet his emphasis is on maintaining those positions which is going to be a larger challenge than ever thanks to Google favoring brands, local search results appearing above listings, images, and live search displaying an ever-changing number of Social Networking entries above the original results. Really this is game i accept but how can we remove from this person’s gambling business activities when we got relief from theirs..??? is their any new revolution for online marketing other than google….??? meet again. Yep, links are the currency of the internet. Who ever has the most wins. Link building Play one of the Important role in Internet marketing business Thanks to You for sharing with us the Benefits of Link building. What a great data. It really show how much matter to be number one. I would say it is still better to be as top as someone can get but ultimately number one is the goal. This is known that cash can make people independent. But what to do if one does not have money? The one way is to get the loan and secured loan. Interesting on a couple of accounts. First, the notion of quantity over quality, which just goes against conventional wisdom of link building for traffic. You can spend a great deal of time trying to get authoritative sites linking to your content, which may be better spent working on volume. Second, it reinforces the importance of being #1 for your keyword. I would suggest one exception to this point, and that is if you are #2 or #3, you need to emphasize the time spend writing your page description and title, in order to make the site more compelling on the SERP’s (of course, while still maintaining your SEO goals). This can modestly improve traffic while still fighting for the #1 position. Hey Chris, that can be especially effective if the #1 spot has a poor call to action in the title. Very true Brandon. It makes me wonder about doing an article about SEO and focus. Sometime, I honestly believe we throw the ‘baby out with the bath water’. Spending so much time optimizing, and forgetting that our pages need to strike a balance between a call to action (or content integrity) and SEO principles. There are many #1 sites which are week on both the title and description, yet they hesitate to change those factors because it could cost them in ranking. In the end, this may be their achilles heel… just a thought..
As I greatly believe in the concept of valuable link, It’s still a reality that numbers counts a lot in link building. It’s certain that a page get rank mainly because of the digits that stimulates the growth of its worth. try using traffic travis .. this software checks backlinks. very interesting article, can anyone recommend a good free tool for accurately displaying incoming links for any domain, opensite explorer and alexa for soe reason are not accurate. I’m also having problems getting accureate rank reports the firefox pagerank plugin. any suggestions greatly received. I know about it because I am doing link building for my sites, well this article is very informative and the reports are also very helpful for me. Brandon, yeah right. Look at the analytics to see where this boost in traffic was really coming from. I just went from the number 9th spot to the number 1 spot for my core search term and I only saw a boost in about 15 more visitors. 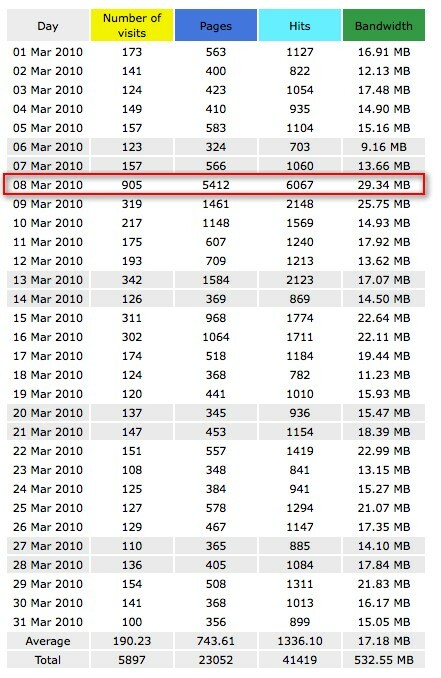 That blows and the term has an “Exact” search of 9,990 visitors per month. I agree to the fact that link building gives impact to the ranking of keywords but the link from good websites are fruitful. Thank you for sharing. Do you have an article (or suggestions) on how to begin building quality inbound links? Yes it’s true that getting higher rank on the Google is totally depending upon the no. of hits or no. of visits. Thanks for your blog. I have started to really push link building and monitoring the results. I still think a link from a high quality site is better than purchasing links. A website marketing technique that consists of creating inbound links to a website to increase web traffic and popularity. I gave up on preaching the top ten a long time ago. I now speak about the top three. But in niches as you have described here you had better be # 1. And after all is said in done links again play a huge role. Whilst I have never paid for any links for any of my clients, this sort of information coupled with the fact that it appears that Google does very little to penalise such tactics makes it very tempting. I won’t for now but…! Yes, it does seem to be a numbers game. The key is finding the best ways to spend time and money to get the greatest number of high quality lasting links. Article marketing has been the answer for me. The nice thing about article marketing is that the links seem to linger longer than say, blog comments. Buy links, article marketing, spam blogs – and as someone else said, bad content, but lots of back links. How does one know the very best way to build a great site, get back links and rank #1. Every day it seems there is a new different strategy. Good relevant content at scale attracts links. Becoming a part of the popular conversation helps with linking. You can also scale up your own site to build internal links.